The coming weekend and days following belong to the largest planet of our solar systems. Jupiter will reach opposition on the 8th of March. That means that the Sun, Earth and Jupiter will be lined up perfectly. The planet will then be opposite the sun, meaning it will rise as the Sun goes down and be visible the entire night. 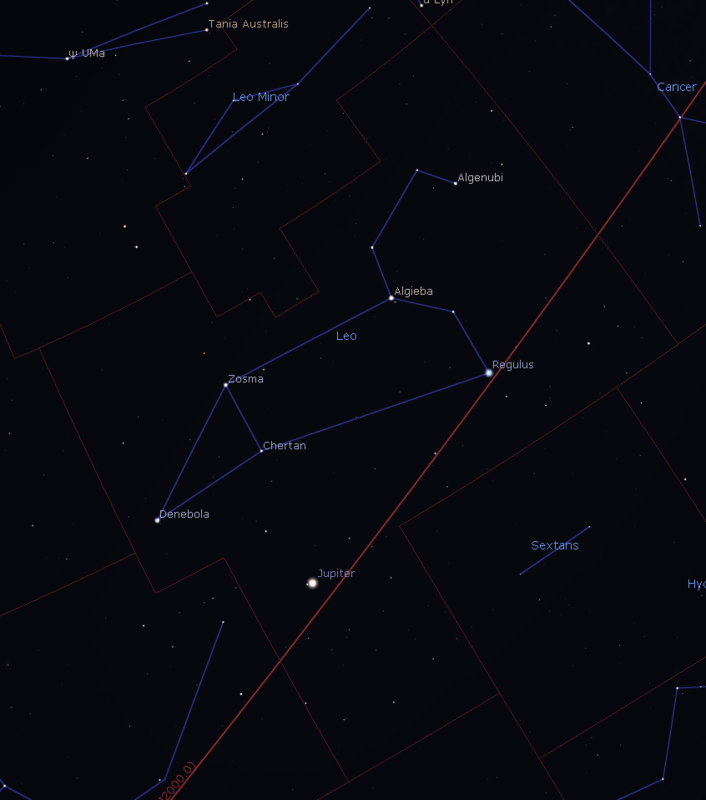 You will find the planet straddled by the constellation Leo. Jupiter generally is so bright and high above the southeastern horizon that we don’t need constellations as an aid in finding it. Nevertheless, a glance at Leo is worth it. Leo belongs to the few constellations that resemble a picture of what they are called. The head of the lion is depicted through a chain of stars, appearing somewhat like a backwards question mark. The chain of stars then leads to the East of the lying body of the lion, ending with the star Denebola. The name Denebola comes from the Arabian, meaning the tail of the lion. In the center of the lion, the star Regulus shines, which is also Latin for the little king. This star dominates the constellation with a blue-white brilliance. The think red line of the graphic above denotes the ecliptic plane (or orbit around the Sun) of Jupiter. Since Regulus can be found in the center of this ecliptic line, the star encounters or is sometimes even covered by various celestial bodies of our solar system, especially the Moon. Other noteworthy sights include the star Algieba, Arabian for the lion’s mane. Even small telescopes or binoculars allow their users to recognize the double star. Back to Jupiter, which will be in the southern part of the constellation. One could argue that it appears to not be in Leo at all. The graphic above however provides an opposing view with the thin red constellation lines delineating Leo. For astronomers, constellations are not simply defined by the stars making up the picture, but also specify a certain area of the night sky. Jupiter’s orbit takes 12 years around the Sun, funny enough being equal to the number of constellations along the ecliptic plane and resulting in Jupiter approaching a different constellation each year. During Jupiter’s opposition, the planet’s all-night visibility will not be the only special feature. The gas giant’s distance to us Earthlings is also relatively short – being approximately 664 million km (approx. 413 million miles) closer. The light from Jupiter will only take 36 minutes to reach us, which for us humans is nevertheless an unimaginably huge distance. At its furthest the distance between big red and us can reach around 970 million km (approx. 602 million miles). From this perspective, one could say that it is pretty close. The proximity also means that the planet will appear especially close when using a telescope, which would allow stargazers to observe the dynamic atmosphere with its dark bands, bright areas along with the many wandering spots (of course the big red one, too). The graphic above gives you the a feel for what to look for in the night sky. Shortly before midnight on the 6th of March, Jupiter will appear in the night sky. 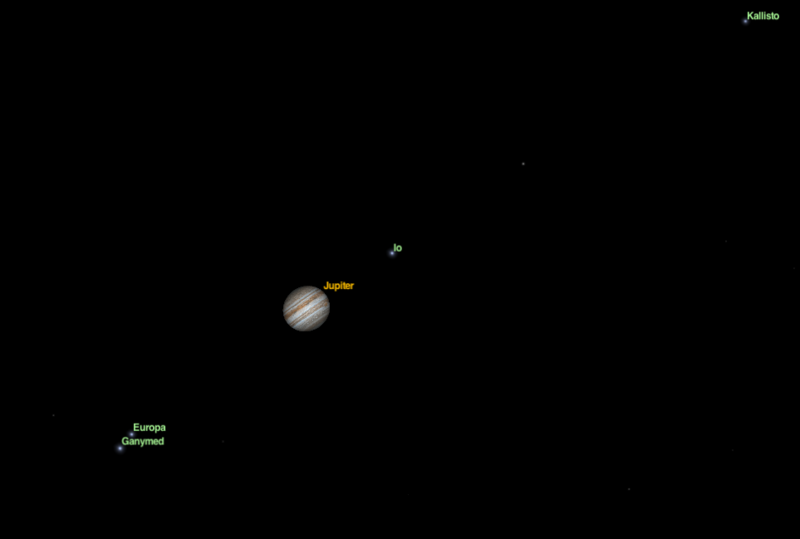 Here we can see the four large moons of Jupiter: Io, Europa, Ganymed and Callisto. The moons, of which Jupiter has more than 60, can even be seen with a telescope. The Italian Physicist Galileo Galilei characterized the four first in 1610, and showed that there are bodies that orbit not the Earth, but rather other planets in the solar system, not yet leading to a heliocentric world view. However, the idea that all celestial bodies must orbit the Earth started to crack. With the GalileoScope, you can follow his discoveries for yourself. The four large moons regularly display their dance with Jupiter and often dissappear behind its shadow. At the time of opposition, we will see the moons and their shadows, drawing across the planet’s blanket of clouds, providing an idea of the 3D-effect. The four Galilean moons are themselves a world of their own. 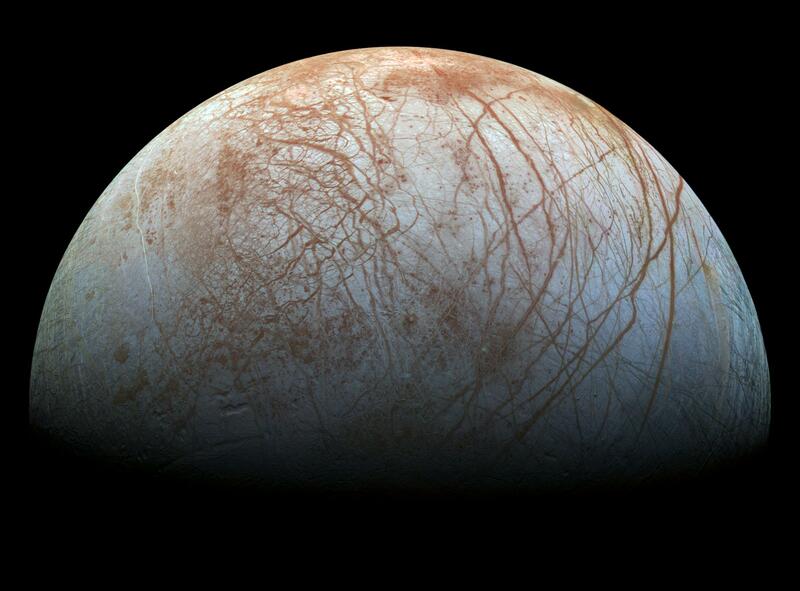 To prove it to you, and because it is simply so awe-inspiring, we have provided an image of Jupiter’s moon Europa, taken by the space probe with a very fitting name, Galileo, which was active in the Jupiter system from 1995 to 2003.